PICTURED AND PRICEDC HERE IN 14KT YELLOW GOLD! Cockers just love people, they seem to want everyone to be happy, most importantly you. She knows you feel the same about all the loved ones in your life. Surely she would insist that you adorn a beautiful pendant in her honor, as she is selfless and nothing makes her more happy than your happiness. What a lovely breed, it's too bad we all can't have one and share in her cheerful and sweet companionship. 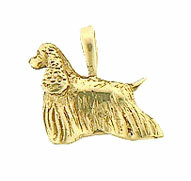 This pendant would look great on one of our lifetime gauranteed chains!